Yes, that is right, I made that crazy shirt. 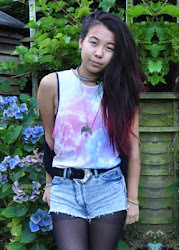 Yesterday I had a huge tie dye/hippy party with my friends (more detailed post about this coming tomorrow) and I decided to tie dye almost all the white things in my wardrobe, so look out for more tie-dye stuff in the future! And yes, I know what you are thinking: "Rebecca, you are an utter failure! Only two days into BEDIS and you have already managed to miss out a day!" I really dislike making a promise and not sticking to it, but I have been seriously busy these two days with the tie dye party and other such shenanigans. I wasn't even in the right frame of mind for today's post, but I felt like I couldn't let you guys down. I have filmed a video to accompany this post, as well as snippets of my tie dye party and me cutting this top, but I have not had time to edit them. I also took these pictures when it was super late, hence the awful lighting, but I felt like I had to put something up! See you tomorrow (fo'shizzle) and PEACE! P.S. Does anyone actually still read my garble below my pictures? Am I writing too much in my posts? Please inform me of your opinion in the comments below! I read it! I love reading what you have to say it makes me laugh and gives us an insight into your awesome personality! This outfit is great! 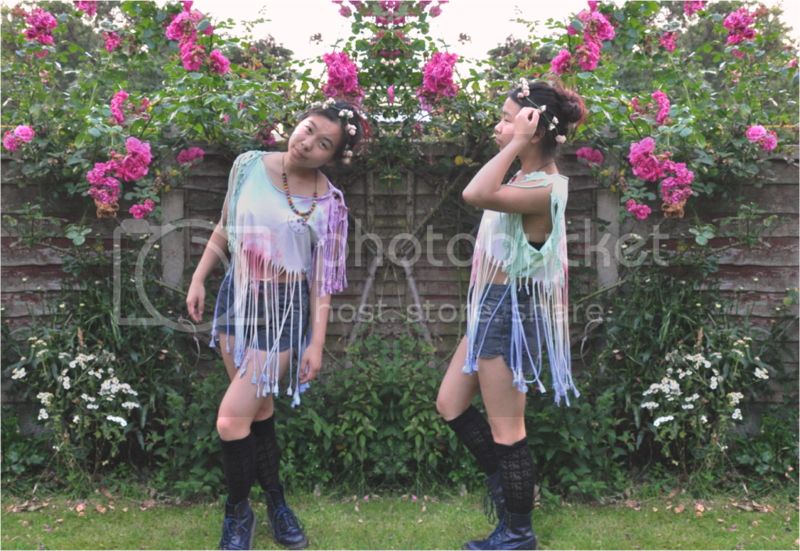 I'm itching to try some tie dye, the shops are overpricing tie die pieces crazily! soo cool! did you just simply cut vertically for the fringe? really excited to do this soon! top looks amazing with the fringing and colours, you did a great job!! You look lovely! Sorry about this but can you send me your address again so I can send the rings to you? I love the top. Such a perfect festival piece! Loving your floral headband and also well done, you did a great job with that t-shirt. Amazing job on the shirt! omg that top is AMAZING! i think the pastel colours look great and i also love the fringes, it's just so cool! 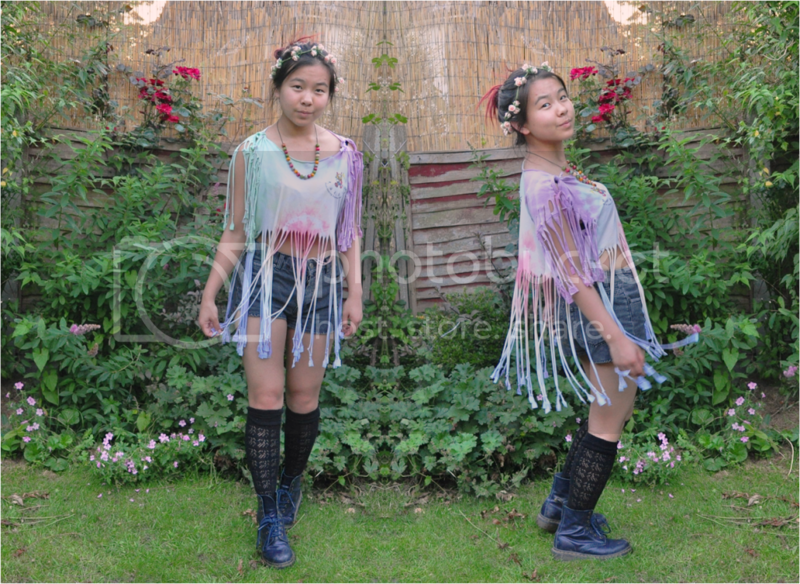 a pity you aren't going to any festivals this year, this would be the perfect outfit! and thank you so much for the comment btw! 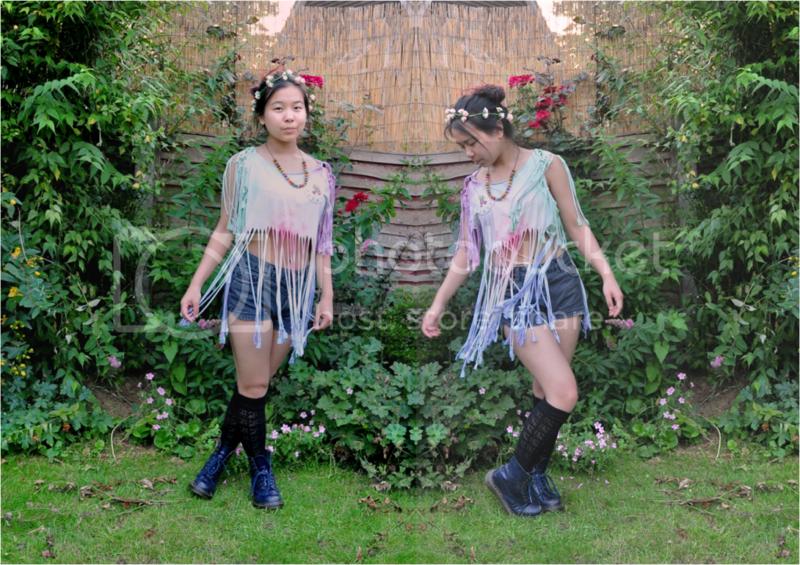 I really love your docs and your top :) I've tagged you for the Liebster award, have a look at the rules if you like!